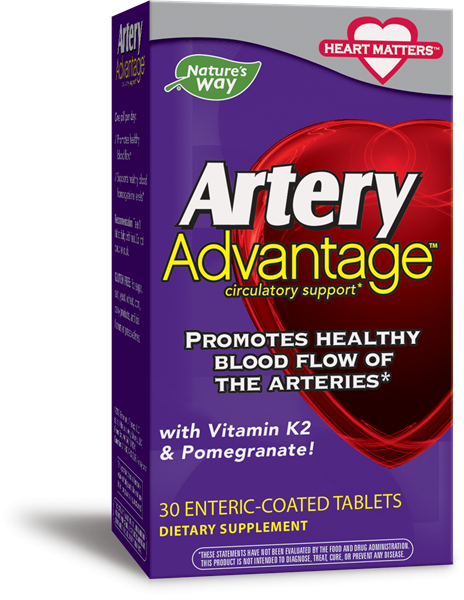 Artery Advantage™ / 30 tabs - Nature's Way®. Get to the heart of the matter! Take 1 tablet daily with food. Do not chew or crush. What’s the difference between aged versus fresh garlic? Aged and fresh garlic extracts are processed very differently and contain different components. To make aged garlic, garlic is placed in an ethanol solution and stored for 20 months. Aged garlic extract contains S-allyl mercaptocysteine (SAMC), a compound that AGE makers claim is the reason garlic is so good for us. Interestingly, fresh garlic does not contain any SAMC. It only appears after the aging process. Although a body of research has been developed for aged garlic, there have been no successful independent replications of aged garlic studies.Allicin is the key proven compound found in fresh, not aged, garlic. Allicin is a complex compound that is only released when a garlic clove is crushed. Allicin helps support cardiovascular health and supports the immune system. * Aged garlic yields no beneficial allicin. Is Artery Advantage enteric coated? Yes, Artery Advantage is enteric coated. An enteric-coated product utilizes a protective outer layer to keep the beneficial garlic extract contained until it reaches the alkaline environment of the small intestine. There, the tablet dissolves, slowly releasing alliin and allinase to form allicin, which is absorbed into the bloodstream as it travels slowly through the small intestine. This ensures optimal absorption and reduces the odor often associated with garlic. What’s the difference between Vitamin K and Natto K2 in this formula? Do not use this product if you have a bleeding disorder, are taking blood thinning medication, or are within a week of any surgical procedure. If pregnant, nursing, or taking any other medications, consult a healthcare professional before use.